The Westminster Halo Tiara, once part of the impressive Westminster tiara collection, is an instantly memorable tiara created to showcase three memorable diamonds. Resting in the center of the original tiara was a large round brilliant thought to be the Hastings Diamond, a gift given from Nizam Ali Kahn to King George III in 1785. The stone bears the name of Warren Hastings, the intermediary asked by the Nizam to convey the gift to the King; he was under trial for corruption at the time, and he managed to get the gem wrapped up in political scandal. 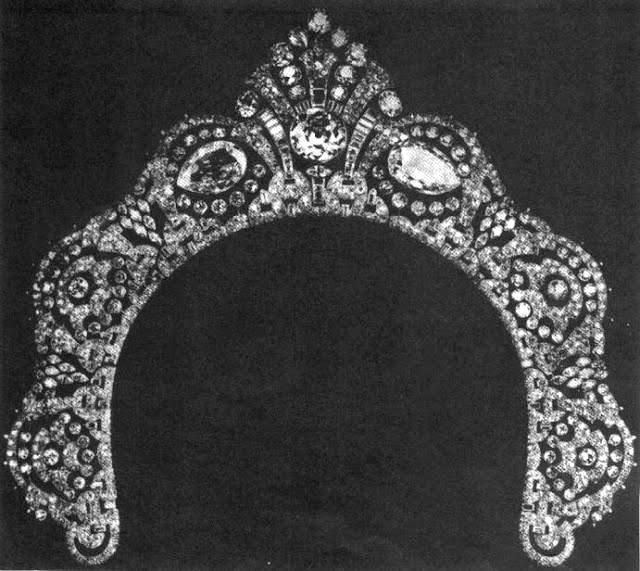 The sides of the original tiara held the Arcot Diamonds, two large pear-shaped stones given to Queen Charlotte by the Nawab of Arcot. These famous diamonds were sold to the crown jeweler (Rundell, Bridge, and Rundell) after the deaths of King George III and Queen Charlotte. 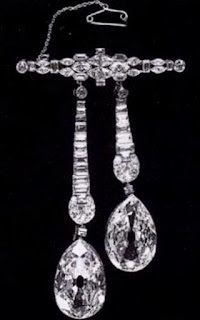 Rundell loaned the Hastings Diamond back to George IV for use in his coronation crown. All three stones were later acquired by the Marquess of Westminster, and they were used in different settings by the Westminster family for several decades. In 1930, the 2nd Duke of Westminster asked the Lacloche jewelry firm to mount the three diamonds in a new tiara. 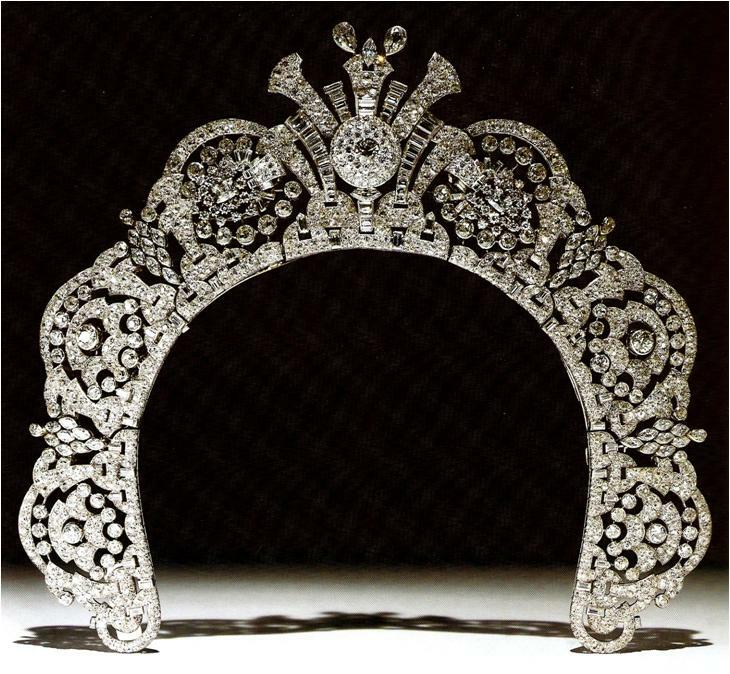 The resulting design used around 1,400 smaller diamonds to create a halo-style diadem that extends out from the sides of the head in a style reminiscent of a Chinese headdress. 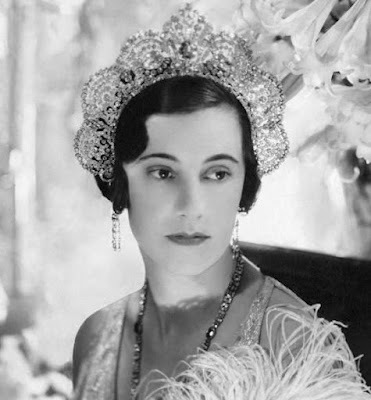 The tiara was worn by Loelia, the Duke's third wife, for portraits shortly after it was made; it was also worn by Anne, his fourth wife, to the coronation of Queen Elizabeth II in 1953. The 2nd Duke died a month after the coronation and his estate drew then-record death duties. In 1959, while still dealing with the inheritance tax, the family sold the grand tiara at Sotheby's. 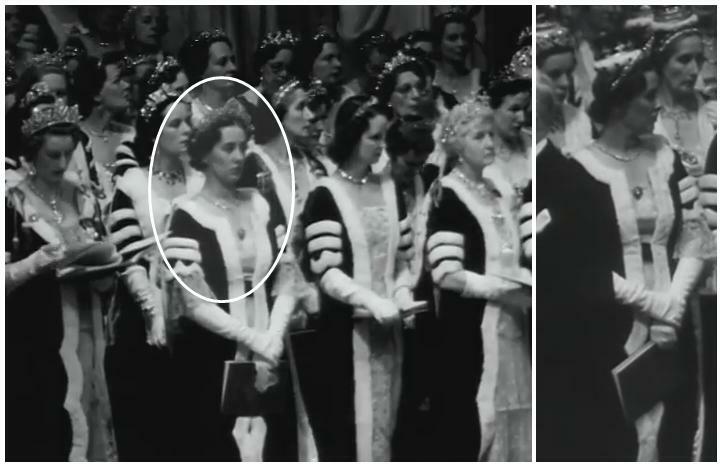 Shots of the tiara in motion at the 1953 coronation show how flat it is from the side. See if you can spot the Duchess of Westminster at the front of a sea of sparkly peeresses in these videos: here at 3:17, and here at 8:42 and 9:44. Jeweler Harry Winston was the next to own the Westminster Halo Tiara. Under Winston's ownership, the three large diamonds were removed, recut, and resold as individual solitaire rings. After the recut, the alleged Hastings Diamond was 26.77 carats, and the two Arcots were 30.99 and 18.85 carats. The larger Arcot stone was last seen as the pendant on a necklace created by Van Cleef & Arpels. The gaps created in the tiara by the removal of the largest stones were filled by a redesign of the top section and with more small diamonds, echoing the rest of the tiara's design. They were also memorably replaced at one point in time with three turquoise stones, like robin’s eggs in a diamond nest. While with Harry Winston, the tiara was loaned for wear by several people (see the links for photos): socialite Rose Movius Palmer wore it in the turquoise version, entertainer Carol Channing used it for an event, and rocker Alice Cooper wore it as a necklace for a portrait. The tiara was sold again at Sotheby's in 1988. It was last associated with Isi Fischzang jewelers. Incorporating large stones into tiaras can pose quite the design challenge for a jeweler. I'd call the Westminster Halo Tiara a success on that front; the design impressively holds up with or without the centerpiece diamonds, though I do prefer the centerpiece of the original design. I think it's a gorgeous and unforgettable piece, but it's also not the kind of piece you can picture being worn today to a state banquet or other tiara event. (In fact, the only regular tiara-wearer I can picture wearing this with aplomb today would be the supremely theatrical Queen Margrethe II of Denmark.) Really, it's unsurprising that it's spent most of its years in the hands of jewelers. Does any version of this tiara strike your fancy?